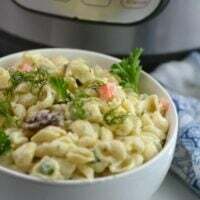 If you are looking for a chilled pasta salad to serve up at your next picnic or BBQ check out this Instant Pot Copy Cat Bacon and Ranch Suddenly Salad! Love bacon? 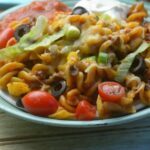 I sure do, and this pasta salad is loaded with tasty flavors, that is topped with bacon crumbles. I think a dish your whole family will love. Not having to wait for the water to boil to toss the pasta in, saves so much time. This Copy Cat Bacon Ranch Suddenly Salad takes just 6 minutes. Yep, you read that right! Picnic season is approaching very fast my favorite time of the year. I love all the cold salads and burgers on the grill. Hanging out with family and friends on the deck. Why can’t my Instant Pot be a part? 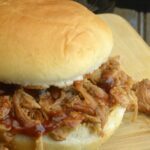 I made 6-minute Potato Salad , Dr. Pepper Pulled Pork, and Cheesy Taco Pasta Salad I wanted to try out making my own copycat bacon and ranch suddenly salad right in the Instant Pot. Creamy and delicious a great addition to any picnic. I can’t believe how simple it was to make. I am never buying boxed Suddenly Salads again. When the warmer days arrive, I use my oven and stove a lot less. I hate heating my entire house up to cook dinner. 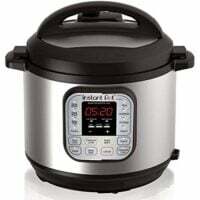 With my Instant Pot, I can cook the same dishes I would on the stove or even the oven without heating our entire house up. Having a salad like this to pair with hamburgers or steak off the grill makes for a perfect dinner for me. My husband is a grill master, so when he is in charge of the protein on the grill, and I cover the side dishes, you know we are in for a delectable dinner. One thing I will say that is over time as this pasta sits it can dry out. If you find that your pasta isn’t that creamy texture, simply add a teaspoon or so of Mayo at a time. Then give it a good stir, and your creamy texture will come back. 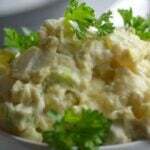 Serve chilled and with your favorite main dish, and watch the whole family gobble it up. When you have bacon, ranch, and pasta all in one meal, you know it will be a side dish that everyone will want a bit of. 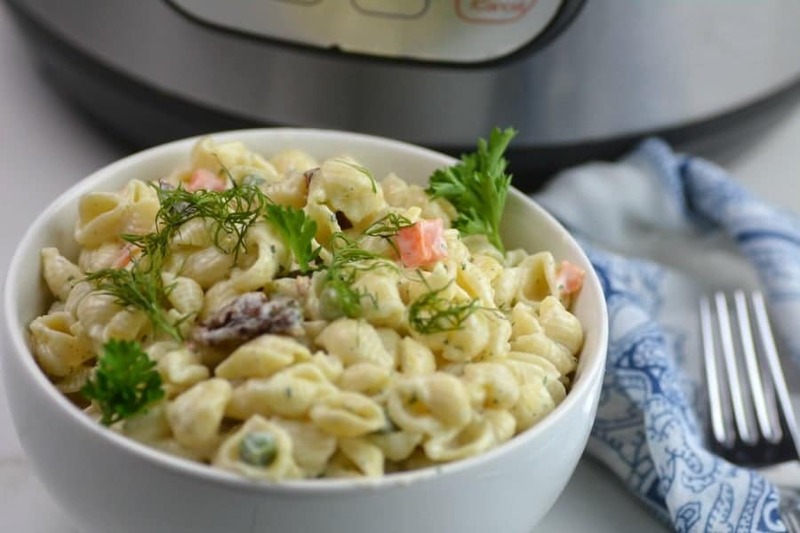 If you are looking for a chilled pasta salad to serve up at your next picnic or BBQ check out this Instant Pot Copy Cat Bacon and Ranch Suddenly Salad! Love bacon? Pour in dry pasta and water. Place peas and carrots on top. Place pot on Manual High pressure for 4 minutes. Rinse pasta in cold water in a strainer for 1-2 minutes or until pasta is cold. Meanwhile mix together mayo and ranch. 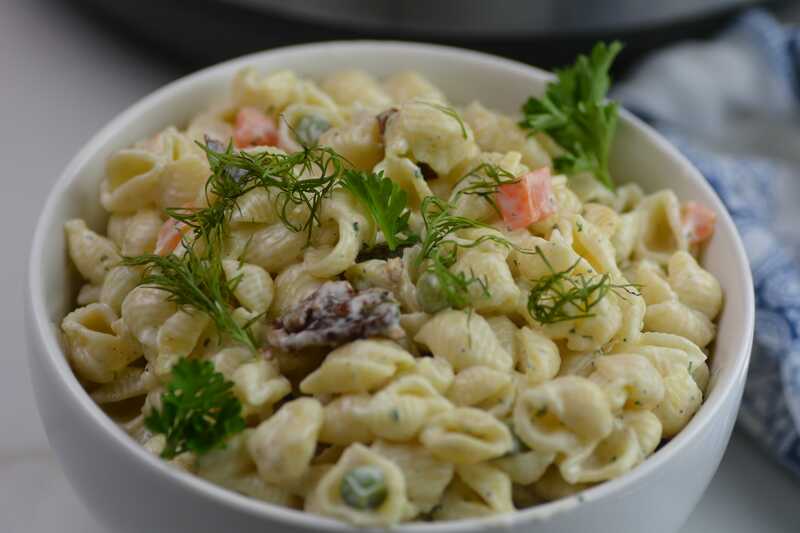 Stir pasta together with the mayo and ranch mix. Top with bacon bits or crumbled bacon. What is “hidden valley ranch”? What are the sizes of your boxes, bags and packets (in weight or volume)? I have a container of Hidden Valley Ranch – how much hidden valley ranch is there in a package a tsp or tblsp or how much? Really good! I just made it on the stove top this time, but will use the IP next time I make it. I added fresh tomatoes from our garden, just because!